Researchers in Berkeley Lab's Materials Sciences Division (MSD), working with crystal-growing teams at Cornell University and Japan's Ritsumeikan University, have learned that the bandgap of the semiconductor indium nitride is not 2 electron volts (2 eV) as previously thought, but is close to 0.7 eV. A technicality? Hardly. The photoelectronic properties of indium, gallium, and nitrogen alloyed together are well known at higher bandgaps, corresponding to low indium content. The low bandgap of indium nitride suggests that by simply varying proportions of indium and gallium, it may be possible to create rugged, inexpensive devices that can convert the full spectrum of sunlight to electric current. If so, these could be the most efficient solar cells ever created. 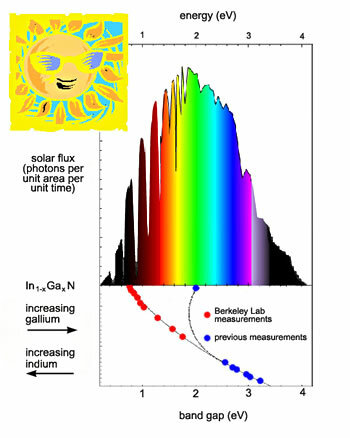 The indium gallium nitride series of alloys is photoelectronically active over virtually the entire range of the solar spectrum. "It's as if nature designed this material on purpose to match the solar spectrum," says MSD's Wladek Walukiewicz, who led the collaboration that made the discovery. Bandgaps fundamentally limit the colors a solar cell can convert to electricity. A semiconductor's bandgap is not a physical space; rather it is the difference between the energy of the electrons in its filled valence band and the energy electrons would need to occupy its empty conduction band. Charge cannot flow in either a completely full or a completely empty band, but doping a semiconductor provides extra electrons or positively charged "holes" that can carry a current. Photons with just the right energy -- the color of light that matches the bandgap -- create electron-hole pairs and let current flow across the junction between positively and negatively doped layers. Photons with less energy than the bandgap slip right through the material. Photons with too much are absorbed, but since each creates just one electron-hole pair, the excess energy is wasted as heat. A one-layer solar cell with a single bandgap can theoretically reach a maximum of about 30 percent efficiency in converting light to power. The best efficiency achieved so far, using gallium arsenide with a 1.43 eV bandgap, is about 25 percent. To do better, researchers and manufacturers stack materials with different bandgaps in so-called multijunction cells. A one-layer solar cell is limited to 30 percent efficiency in converting light to power, but materials with different bandgaps can be stacked in multijunction cells. 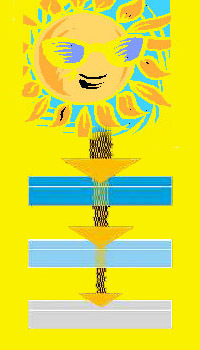 Each layer responds to a different energy of sunlight. In principle, dozens of different layers could be stacked to catch photons at all energies, for efficiencies better than 70 percent -- but a host of problems intervenes. If the dimensions of adjacent crystal lattices differ too much, for example, strain damages the crystals. Other limits are imposed by opacity, poor heat capacity, and the need in some materials for thick layers to absorb photons. Most solar cells are made from silicon. Cheap, amorphous silicon-based solar cells have efficiencies of less than 10 percent, and the efficiencies of even the most advanced single-crystal silicon cells are limited to about 21 percent. That's because silicon is an "indirect bandgap " semiconductor, in which creation of an electron-hole pair requires participation of the crystal lattice vibrations, wasting a lot of an incoming photon's energy. In direct bandgap semiconductors, however, light of the right energy does not vibrate the lattice; thus it creates electron-hole pairs more efficiently. All direct-bandgap semiconductors combine elements from group III of the periodic table, like aluminum, gallium, or indium, with elements from group V, like nitrogen, phosphorus, or arsenic. The most efficient multijunction solar cell yet made -- 30 percent, out of a theoretically possible 50 percent efficiency -- combines just two materials, gallium arsenide and gallium indium phosphide. Gallium indium phosphide is a "ternary" compound, in which two elements from group III are alloyed with one from group V. It was Berkeley Lab's investigation of a related ternary compound that opened startling new possibilities for multijunction solar cells. The first clues came not from studying how semiconductors absorb light to create electrical power -- but from the reverse.